This may be blasphemous to say, but I’m not a big fan of Mexican food. I love Chipotle burritos, which I realize are very Americanized and are not really Mexican burritos at all. Other than that, if it’s Mexican but it’s not fried, I probably won’t like it. I used to love tamales and enchiladas, but something in my taste buds changed a while ago, so now I really only like taquitos, flautas, tacos, and nachos. Note: Leftover beef can be used from pot roast or other slow cooked beef, as long as the seasoning isn’t overly strong. Also, chipotle chili powder can be used in place of the chipotle peppers and adobo sauce, just add a little to start and increase to taste. Place beef roast and 1 cup water in a 5-quart slow cooker, fat side down. Sprinkle the packet of taco seasoning on top of the roast. Cook on low for 8 to 10 hours. When meat is cooked and tender, remove the roast and use 2 forks to shred the meat; shredded beef should total about 3 cups. Slice any larger pieces of roast across the grain so the beef is shredded into ½ to 1-inch pieces and place in a large bowl. Preheat oven to 425 degrees F. Lightly spray baking sheet with cooking spray. To prepare chipotle peppers, slit the pepper open. Remove the seeds either by scraping carefully with a knife or running the open pepper under a slow stream of water until the seeds have been rinsed away. In a small bowl, combine chipotle pepper, adobo sauce, garlic powder, coriander, cumin, chili powder, lime zest, and lime juice; whisk well. Pour over the beef and gently toss to coat. Wrap a pile of about 10 tortillas in damp paper towels and microwave for 1 minute to soften. Working with one tortilla at a time, crumble about 1 tablespoon cheese in a line across the center of the tortilla. Top with 1 to 2 tablespoons shredded beef mixture. Tightly roll and place seam-side down on the prepared baking sheet. Continue to roll until all of the tortillas are filled, reheating more tortillas as needed. Lightly spray the top of each taquito with cooking spray and sprinkle with kosher salt. Bake for 15 to 20 minutes or until golden brown on the edges. Serve warm with sour cream, salsa, and guacamole. 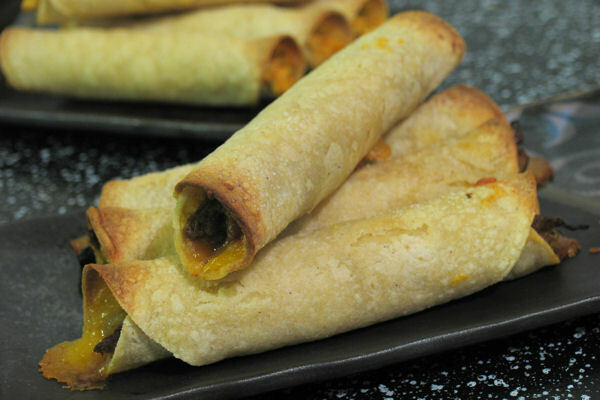 To freeze: Prepare taquitos through spraying with cooking spray and sprinkling with salt. 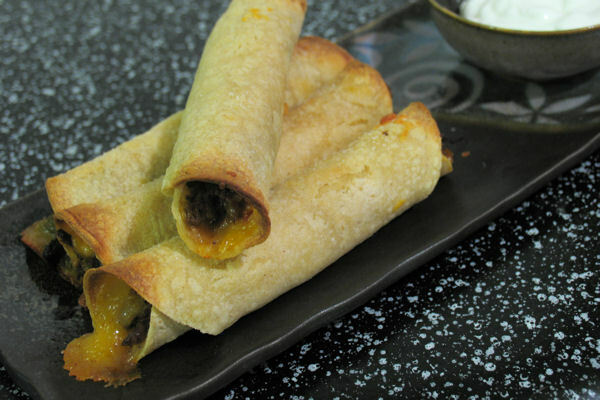 Lay taquitos in a single layer on a baking sheet, lightly spaced out and place in freezer. Once frozen, store in freezer bags. Bake at 425 degrees F for 20-25 minutes.